Using Job Match to Hire and Promote Successfully | Resource Action Concepts, Inc. The author Jim Collins, in his best selling business book Good to Great, says that the first thing you need to do to become a great company is to get the right people on the bus; and they will help you figure out where to drive the bus. Sage advice, but what’s the best way to do that? Running a successful business is like a puzzle. All the pieces have to fit, and if the people don’t fit, they can give you fits. The hiring and promoting processes are plagued with errors. For example, if you promote the wrong employees, you could lose on two fronts – you lose good workers in the jobs the people were performing, and you end up with individuals who cannot perform in the jobs they have been promoted to. How many times have we heard stories about the best sales person or the best engineer being promoted to a managerial position, only to fail at that position because the individual is a good sales person or a good engineer, but a poor manager? Adding a background and reference check gives you a 26% chance of getting a top performer. Adding personality testing gives you a 38% chance of hiring a top performer. Adding personality and abilities testing gives you a 54% chance. Adding personality, abilities, and interests testing increases your chances to 66%. Adding personality, abilities, interest testing and JOB MATCH increases your chances of hiring a top performer to 75%. 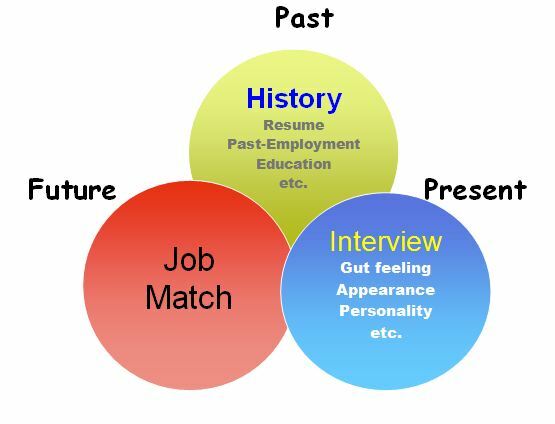 Job match is the key, and to hire successfully, you have to look at the past, the present, and the future. First you must delve into the past and research the prospective employee’s resume, including past employment, education, etc. Then you go through the interview process in order to get a “feel” for the person. Finally, you need to look to the future and ask yourself if the candidate is a fit in terms of the job, the company culture, the manager, etc. To deal with Job Match, in working with my clients, I recommend an instrument called The Prevue Assessment to help them promote, hire, and train and/or coach their employees. This instrument offers some key elements for putting the right people on the bus.